We recently did some extended long range shooting with several rifles at a “secret range” where we could shoot out to one mile. I teamed up with Paul Philips, a highly successful National and International F-TR shooter with several National records. We started out shooting a Sako TRG-42 at 1200 yards. This is the same rifle I shot in Wyoming last year at distances out to 2400 yards. This rifle shoots the new Berger 300gr Hybrids, at 2700 fps. We were pleased to find that the Nightforce NXS 5.5-22x56mm scope has plenty of elevation to get to 1200 yards with this bullet, especially when mounted on a Near Mfg. +45 MOA rail. 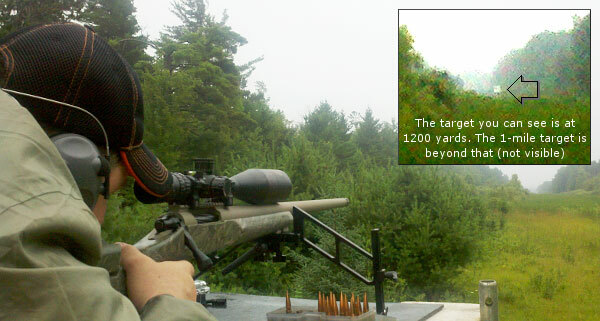 The drop from a 100-yard zero to 1200 yards was predicted to be 34.75 MOA. The size of that 5-shot group was nothing to brag about (1.5 MOA), but what I found satisfying is that the group center was exactly centered for vertical on the target. That means the calculated .418 G7 BC and all of the other variables that went into this trajectory prediction were spot on. Next, we shot the LaRue 7.62 OBR rifle at 1200 yards. This rifle produced a 5-shot group of 9.7″ (.85 MOA) with off-the-shelf Applied Ballistics Tactical ammo loaded with .30-cal 175gr Berger Tactical bullets. These bullets only have a muzzle velocity of 2572 fps from this short barrel, which means that in our conditions they were subsonic past 1000 yards, running 1080 fps at 1200 yard. Going subsonic didn’t prevent the 175gr bullets from shooting a sub-MOA group. However, I was a little disappointed that the group center was 9″ high (0.8 MOA) compared to the predicted trajectory (657″ drop from a 100-yard zero). Note this 9″ error in predicted drop could be produced by small variances. The 9″ shift could be explained by a 14 fps error in muzzle velocity, or a 2% error in bullet BC, or a 5-yard error in range measurement. For our final test, I shot Berger’s newest Tactical bullet; the .30-caliber 230gr OTM projectile. 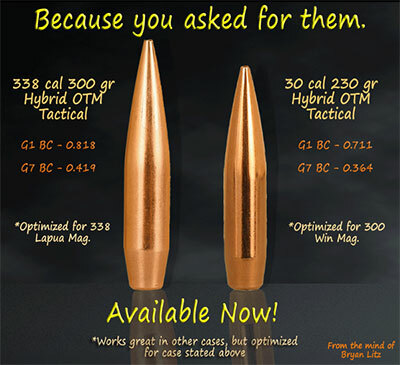 This bullet has a tested G7 BC of .368, and a G1 BC of .719. Now this isn’t my most accurate rifle and I haven’t had an opportunity to really work up a good load. As a result, I shot an unimpressive 20″ group (1.8 MOA). But the predicted drop was only off by 2″ (less than 1 click) based on the BC’s listed above. After shooting at 1200, we lobbed some bullets on an 8’x8′ target at 1760 yards (1 mile). At this range, the TRG-42 put the 300gr Bergers on target with four of five shots in 1/2 MOA with a flyer to make the total group 21″. 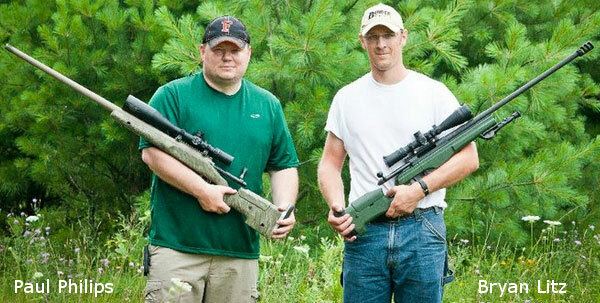 At this range my group center was 18.5″ (1.1 MOA) higher than predicted. Paul Philips* shot his custom .338 Lapua Magnum rifle. This is a Dave Tooley-built Tac-338 with 30″ Brux barrel, Stiller action, McMillan A-5 stock, and Nightforce NXS 12-42×56. Paul shot at the same target and was able to hold between 1/2 and 1 MOA groups with the same 300gr Berger Hybrid bullets. Paul’s group centers were also about 1 MOA higher than predicted. This small error in prediction isn’t very troubling though, as we’re not entirely confident in the range measurement. As 1760 yards (one mile) is too far for a direct laser rangefinder measurement, the distance was determined with a combination of GPS and Google maps. At that distance, a range error of just 15 yards (out of 1760) could cause the percieved 1 MOA error in predicted drop. So, if the target were really at 1745 yards, instead of 1760 yards, it would explain why we were hitting 1 MOA high. Alternatively, if BC error were the reason for hitting high, it would suggest the G7 BC for the .338-cal 300gr Berger Hybrid is .427, as opposed to the currently advertised .418; a 2% difference. For me, the thrill of shooting these extreme long ranges isn’t just about the group sizes, but the accuracy with which the trajectory can be predicted. The shooter who understands ballistics and inputs the right variables should be able to center a 1.5 MOA group well past 1000 yards. He can be more effective, on targets at extreme ranges, than someone who can shoot an 0.5 MOA group but can’t keep it centered. Of course the most impressive of all is the shooter who can combine precision with accuracy and center the 0.5 MOA group at extreme distances! Share the post "Shooting at 1200 Yards and 1760 Yards (1 Mile) with Bryan Litz"
Ruger Stock Has Soared — But Is It Still a Good Investment? If you’d invested in Ruger stock three years ago, you’d be sitting pretty right now. Sturm, Ruger & Co. (NYSE: RGR) has done exceptionally well since the 2008 Presidential election, despite the faltering economy. 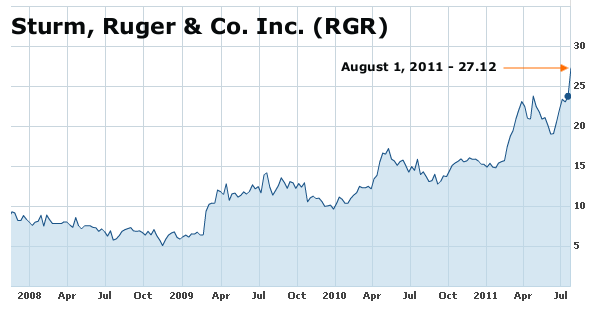 Ruger’s stock price is currently trading above $27.00 per share, up from a low of $5.18 per share in November 2008. That’s an increase of more than 500%. And during that period, Ruger also paid a modest dividend. Hard to beat a huge stock value increase with dividends to boot. Is Ruger still a good investment, or has all the money already been made? We caution any potential investor that “what goes up must come down”. Still, Ruger has solid fundamentals and the company has made some smart decisions, moving into the concealed, carry gun market with huge success. Motley Fool Takes Close Look At Sturm, Ruger & Co.
READ FULL STORY: The Motley Fool Analysis of Sturm, Ruger & Co.
Share the post "Ruger Stock Has Soared — But Is It Still a Good Investment?" Top firearms industry executives and pro shooters participated in the Ninth Annual Shooting Industry Masters, held July 22-23 in Park City, Kentucky. A record-breaking 370 competitors raised $37,000 for NSSF’s First Shots program. This brings the amount raised by the Masters for First Shots to $94,000 in three years. 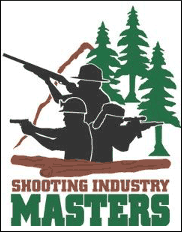 The Masters, held at the Rockcastle Shooting Center, Park Mammoth Resort, is owned and operated by FMG Publications. 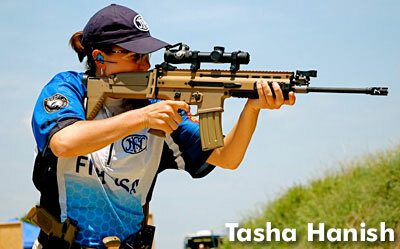 The leading male and female pro shooters were Jerry Miculek (Team Smith & Wesson) and Tasha Hanish (Team FNH). The Masters is a handgun, rifle, shotgun competition divided into two classifications: Industry and Open. 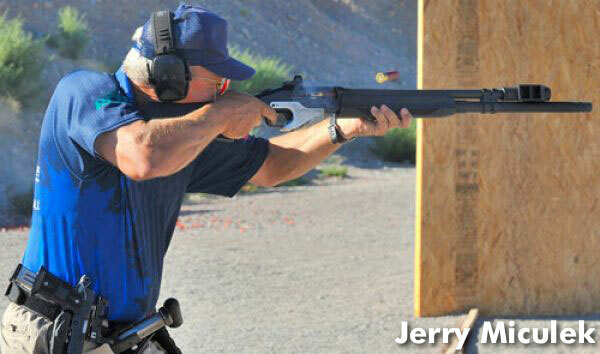 The Industry class is for new to intermediate shooters, while the Open class is for professional and advanced shooters, many of whom compete on the USPSA and 3-Gun Nation circuits. Regardless of class, scores are not published. This helps maintain the traditional, no-pressure, fun atmosphere of the Masters. High Team: Open Class – Team JP Enterprises, Tony Holmes, Kurt Miller, Don Bednorz, Trapr Swonson and John Paul. Share the post "2011 Masters Tournament Raises $37K for First Shots Program"